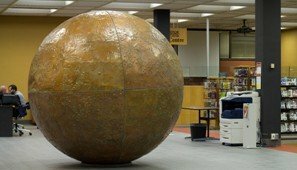 WPL Partners With Artcite Inc.
Windsor Public Library is excited to collaborate with Artcite Inc. by temporarily hosting two works of arts as part of Artcite’s Dar’a/Full Circle exhibition. This group exhibition presents the work of artists who address the circle as a motif in their work. Curator Jamelie Hassan felt that the circle “would make a compelling group exhibition that reminds us of the pervasiveness of the circle found all around us and the circle that we create as community. The idea within the two words “full circle” is of the power of return to beginnings, to place and to ideas.” As an organization that values community-building and the sharing of ideas, WPL felt that participating in this project was a wonderful opportunity. 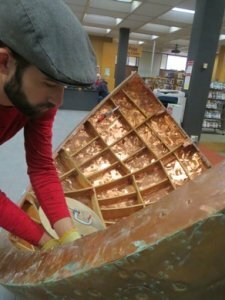 On display at the Central Library until April 21 are “Moon” by artist Tom Benner and “Wish on Water” by artist Soheila Esfahani. 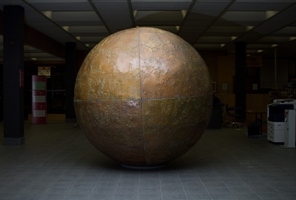 In addition to the two pieces at the Central Library, visitors can view the rest of the exhibition at the Artcite Gallery (109 University Ave W). For hours and more information about the exhibition please visit the Artcite website. 1 Response to "WPL Partners With Artcite Inc."
Great to see continued interaction happening between local arts organizations, artists and the WPL. WPL’s Main Branch has always been good at commissioning great art work for their flagship building. Temporary art installations allow for a changing aesthetic dynamic and cultural exchange of ideas and social interlude. Perhaps consider furthering an artist lecture series or artist workshops.